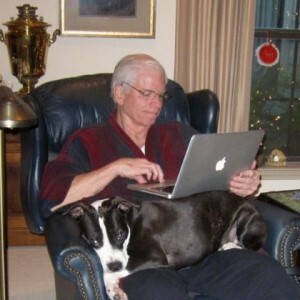 You saw this picture of Ban with dog and laptop in the Spring 2014 Newsletter. Did you wonder what he might be doing on the laptop that was so very interesting? Here’s the rest of the story as sent to us by Ban. This is a 10 minute slide show of my Texas pictures with fabulous music by the Dallas based Vocal Majority (150+ voice men’s chorus that has been winning many International Championships for 30+ years). Hopefully you will you will “LIKE” this new version and forward it to your friends. The 2010 version was made from pictures I happened to have and used cattle and flower pictures as fill time. At the 2014 publishing time the 2012 version had about 85,000+ views. This slide show is much more intentional trying to cover more of the State and adding more Texas flavor. It has given me an appreciation for Texas’s variety and size. Texas is a very BIG State! I got as far as the Louisiana border (East), Corpus Christi (South), Midland (West) and Amarillo (North). Unlike the 2012 version this is HD and places are better identified. Roughly 60 pictures are reused from the 2012 version and many of those are in the first few minutes. There are 158 pictures (30+ more than the 2012 version) so many go by fast as the music length hasn’t changed. Pictures of Dallas, Houston, and Austin are much improved. A tip of the hat is given to the oil industry. Some fun was added with names of little Texas towns. Pictures from East Texas, Galveston, Corpus Christi, sites around Houston, Presidential Libraries, Buffalos roaming, Blue Bell ice cream, etc. were added. Sorry I wasn’t everywhere and that some pictures don’t perfectly match music but I’m close. (Confession the deer playing pictures are from Colorado & the Muleshoe sign was borrowed from the Internet – I visited all the other little towns and even Hoot & Holler and Bug Tussle but someone stole their signs). For those outside of Texas, clearly the time to visit Texas is in the spring when the Bluebonnets are blooming. The Bluebonnet pictures were taken in the Llano area, the Willow City Loop, Brenham and Ennis. Turn the volume up as the music is terrific! If you like this click “LIKE” and forward to your friends.